The interior remains fully furnished and looks as it did when the school was in use. Local kids dressed in costume simulate what school must have been like for their ancestors. 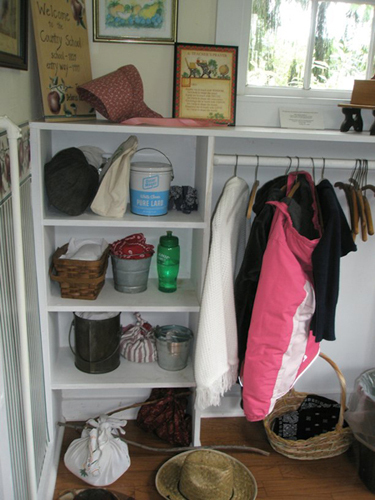 Schoolkids stopped at the entryway to put their things away before they experienced a day at a country school of 100 years ago -- note the straw hat and lunch buckets. 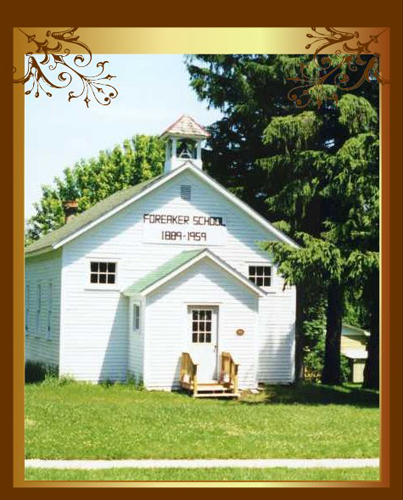 The Foreaker School, 606 W. Broadway St., Viroqua, was built in 1888 by James Mankin for $395. It was located in the Town of Liberty, southeast of Viroqua. 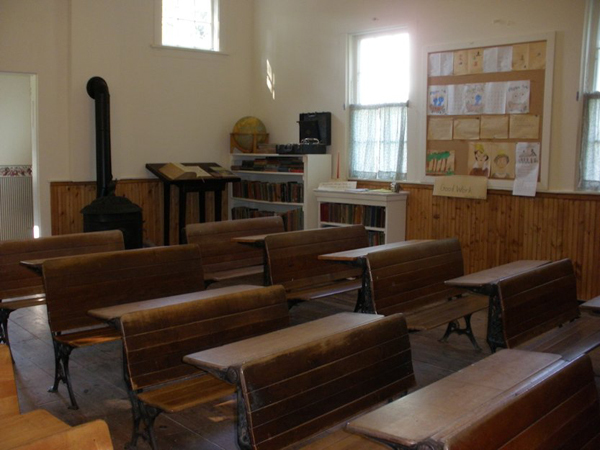 The one-room school operated until 1960 when it was closed due to low attendance and consolidation of schools. The school was a typical one-room facility serving the immediate area of southeast Vernon County. Early board members were area farmers, businessmen and parents; among them, John H. Smith, R. Snead, J.S. Harris, Thompson Glass and Warren Fish. William Conner was the first treasurer in 1869, and Sarah White, the first teacher in 1870. The first instructors in the frame building were Jennie McGarry, Minna Minchel and Susie Lammes. In 1963, Vernon County purchased this building and had it moved to its present location on West Broadway in the city of Viroqua. It is being cared for by the Vernon County Historical Society and used by third-graders of the area each spring as a one-day learning experience. 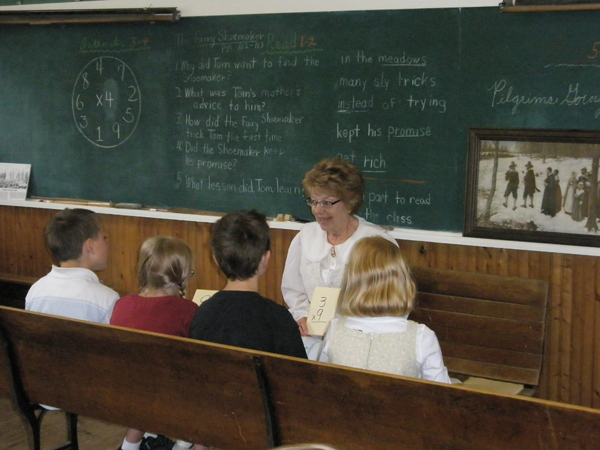 The children are encouraged to wear dress styles of the pioneers and to bring their noon lunch in buckets, jars and baskets, just like they did in the old days. Recess consists of old-fashioned games, and hand-washing is done from a bucket of water. Their school day consists of learning the "basics" by one teacher in one room. 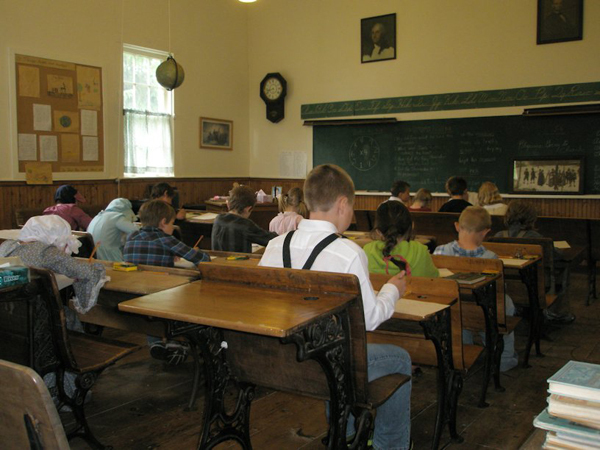 "Students who attended one-room schools did "seat work" while the teacher worked with other students at the recitation bench, located in front of the room. Students doing their seat work would communicate with the teacher using fingers. One finger was the restroom, two fingers the library and three fingers help," Miller said. "The teacher would nod at the students, so there would be no interruptions." "The teacher played many roles. She was the librarian, nurse, principal... She would perform health checks, making sure fingernails and hands were clean, seeing that teeth were brushed and looking for any redness of the throat." --Jill Miller, a retired teacher and historical society volunteer.